As a HealthCorps coordinator, I plan lots of events. Assemblies, guest speakers, crafts. You name it, I’ve planned it. But I never thought that I would plan to share my own story. A story of struggle, a story of hope! We decided to create hope in my elementary school by participating in the festivities of Red Ribbon Week. 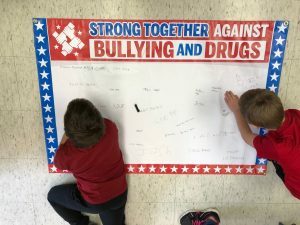 We struggle with both, bullying and drug abuse, in our small community, so naturally we decided it to be in our best interest to participate. As I continued to tell my story, tears streamed down the faces on my students. I could see it in their eyes that they no longer felt alone. It took every fiber of my being not cry with them for the words and the experiences are still with me. 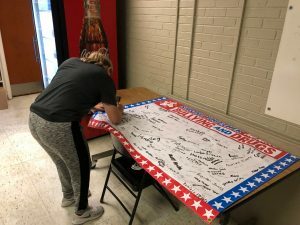 Following the assembly and Principal Baker’s final words, our students signed the Red Ribbon Week Pledge to end bullying and drug use in our community. I shared my story two more times, but the words of a 5th grade student stuck with me. He said, “Ms. Sarah, you make me feel like I am no longer alone.” He made me realize that just a smile, story, or even a “hello” can go a long way. He is one of the many reasons I love my job and will continue to educate the future.